Smart watches, glasses and other of the latest wearable internet gadgets have been banned among China’s armed forces over concerns of security breaches, state media reports. "The use of watches that have internet access, location information, and telephone conversation functions should be considered a violation of secrecy regulations at army barracks," AFP cited report in the People's Liberation Army Daily, the Chinese military's official newspaper. The report is said to have been issued, after a soldier tried to use a smartwatch to take a photo of his comrades stationed at the eastern city of Nanjing. He was stopped by his squad leader and the matter was reported to higher authorities, which ruled that such devices could harm military action and security. The report in the Chinese military mouthpiece, warning against gadgets, specifically mentioned high-tech spectacles. "When officers and men put on these type of spectacles, it is extremely possible that army positions can be tracked, endangering the security of military operations," was said in the newspaper. The daily also wrote that teaching materials and warning signs have been supplied amongst military personnel to ensure the incident does not happen again. 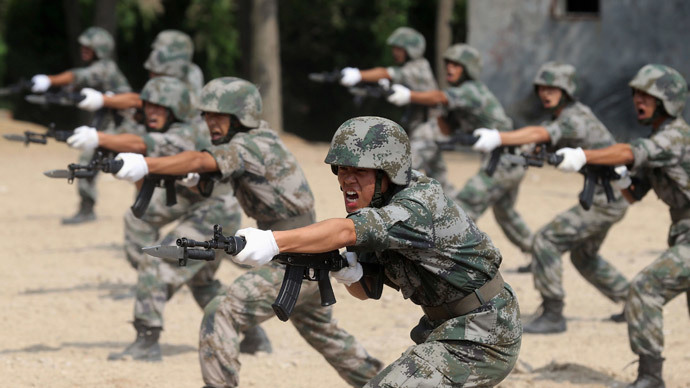 China’s Defense Ministry has not officially commented on the matter, but individual members of the Chinese Army have, under anonymity, confirmed to NBC News website, that smart watches and other wearable gadgets with internet access are now forbidden among the armed forces. China has been particularly concerned with the issue of cyber security following Edward Snowden’s revelations on the massive snooping carried out by the US National Security Agency (NSA). One expert said the move to ban internet gadgets was a natural extension of restrictions already placed by most armies around the world on mobile phones. "Anything that is networked - whether it is in your pocket or on your wrist - can be remotely accessed and exploited by others to provide an advantage to adversaries,” Peter Quentin, a research fellow at the British defense think tank Rusi told the BBC. Security concerns aren’t the only reason armies have been reluctant to allow soldiers use gadgets. In 2012, NATO banned its forces in southwestern Afghanistan from taking personal photos during military operations. The ban came in the wake of major scandals involving US servicemen posing for pictures with dead Taliban fighters.